It's been a while since the last post and now that I have the workshop back up and running again after getting the new lathe and mill operational, I though I would get back to some steam. I am going to make a steam plant for the new engine so the first thing I need is a boiler. 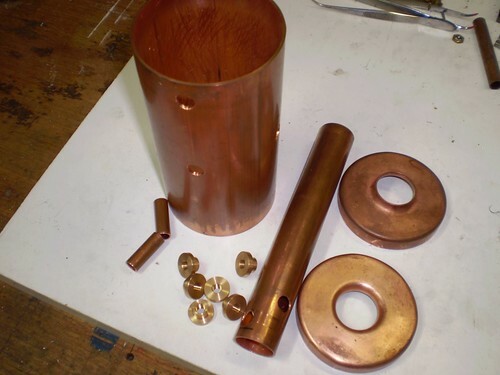 I am going to re-use the design from the last boiler I made, but I am going to skip the superheater and use cross tubes at the bottom of the fire-tube instead. 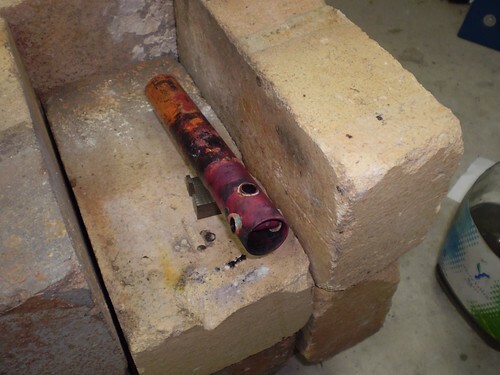 The design is a simple centre flue fire-tube boiler which I will fire with butane gas. The main shell is 75mm is diameter and the two flanged ends are 1.6mm in thickness (3" and 1/16" respectively for our American cousins). The fire-tube is 25mm in diameter and about 185mm long. The cross tubes are 10mm in diameter and are arranged at 90 degrees across the fire-tube. They have a slight incline so that they are not horizontal. The bushes are bronze (never use brass in a boiler!!) and threaded 1/4"-40 ME. 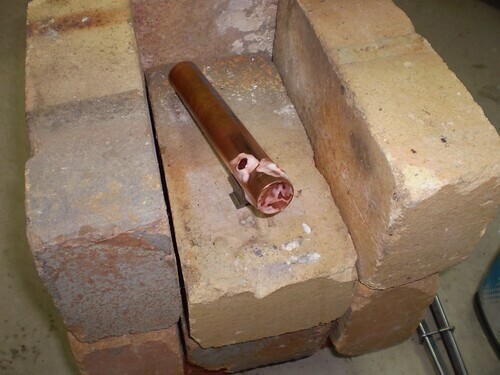 The first task is to silver solder the cross tubes into the fire-tube. This then goes into the citric acid bath I have in the plastic container to pickle overnight. This will remove all the oxidation and mess. It will come out of the bath all clean and ready for the next stage.